The drafting of the Jutland play sheets is going pretty well although they will be rather larger than the two sides of A4 I originally intended. the reason for this is very simple - in my opinion the original design was not particularly well laid out and the ship damage charts, although at first glance look pretty comprehensive in terms of what they are used for contain a number of omissions. I had thought to include all the relevant data on the version I am drafting but that is a little on the unwieldy side. I have a couple of ideas around this so will post them once I have played around with them a little. A more significant problem concerns the number of gunnery boxes a Capital Ship has (a Capital Ship in this game is anything armoured cruiser sized and larger). When I spent some time messing about with these rules a while ago I based all my findings on the data shown for the ships of the Royal Navy. For example, HMS Warspite has 12 gunnery factor boxes. Given that she was armed with 8 x 15" this works out that each gun is worth 1.5. The standard that appears to have been used is for a single 12" gun being represented by a single gunnery box so, for example, HMS Dreadnought will have 10 such boxes. I was then able to convert other calibres into boxes by the simple expedient of using a multiplier applied to the number of barrels. I then went ahead and calculated a whole host of ship data cards on that basis. So far so good. Then I looked at the German ships - and it all went horribly wrong! 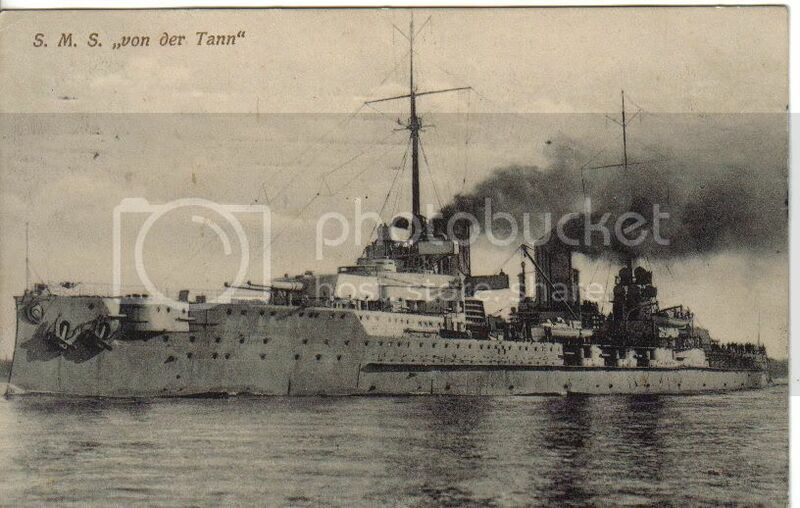 Take for example the battle cruiser SMS Von Der Tann. She was armed with 8 x 11" guns yet in the game has 10 gunnery boxes. The first German dreadnoughts - the Nassau class - were armed with 12 x 11" of the same type of gun as the battle cruiser ( the '04 45 cal weapon rated by Janes as A5) and yet only have 12 gunnery boxes. This effect was repeated throughout the High Seas Fleet in the game. in fact, the only ships that have the correct number of boxes for the number of guns carried are the aforementioned Nassau class and the pre dreadnoughts. In a way this has helped me out because I have no idea as to why the number of boxes should be different (excepting for weapons of a larger or smaller calibre) so I will go with the system I am working on (one of my 'tweaks') as at least I know it will be consistent. I am going to deiate from the numbers used in the game for gunnery factors as I want to use a 'one hit box for one barrel' approach. Variations in calibre will be accomplished by the use use of column shifts when firing so taking HMS Warspite as an example, she has 8 x 15" so would ordinarily fire on the 7 to 8 factor column. She will get a two column shift to the 11 to 12 column and roll for hits accordingly. The column shifts will be included in the ship data card. The game lumps gun calibres by ship type and so this is the approach I shall adopt with the categories being BB, BC, B, CA, CL and DD. The protection value of the ships appears to be based on the maximum thickness of the belt armour which again I shall use as it will be uniform. For all the factors I apply, including ship speed, I will be using a combination of Conways and Janes so will be on pretty firm ground as far as accuracy is concerned. On with the typing then! Jutland 1916 - this image is from a Christmas card! It has been a funny old day. I have spent most of the morning on my usual job hunt - making phone calls and checking the internet - and acting as occasional waiter for my son who is still feeling pretty grim (and will do so for a while yet). At the time of writing we are waiting for the Police to call for all the statements etc for their investigation. It all feels all very 'limbo-like' at the moment and I will keep you all posted on the progress as and when anything transpires. Continued thanks though to everyone for their kind words and thoughts. In the meantime though, and as a very welcome diversion, I have continued with work on my Jutland project. I should clarify at this point exactly what I am actually trying to do - namely use the game system from the original version(s) of the game (1967 and then 1974) for naval wargames set during WW1 or effectively 1900 to 1920. In order to do this I am essentially distilling the numerous magazine articles down into the original rules. My own involvement will be kept to a minimum, simply because the original system was designed around, in my opinion, very sound principles. My first step is to prepare a playsheet as the original game never featured one. I have nearly completed this for the tactical rules and am hoping to try them out over the next few days with the ship blocks I prepared earlier. I will try the game out using the original rules before I start changing anything but at this stage I am only expecting to adjust the ranges. Ironically my plan is to use the same maximum range as Paul Hague in his Sea Battles in Miniature - 40" or 20,000 yards. Once I have reacquainted myself with the rules and system then the 'tweaking' can begin in earnest. Then of course there is the question of the models. Given the potentially wide-ranging nature of what I am planning - far beyond the chilly confines of the North Sea - I suspect that 1/3000th will be the scale of choice, simply due to the sheer amount of choice available from Navwar. We collected my son from the hospital this afternoon looking a whole lot better than he did but still in pain and drugged up to the eyeballs. The forces of law and order are now on the case and the family has been thanking pretty much every deity they can think of that it was not any worse. He is now safely ensconced in his room with endless repeats of Top Gear to watch and a cocktail of mind altering substances that would not have been out of place at Woodstock. Huge sighs of relief all round then. I have broken with tradition slightly and so offer my apologies for not answering each and every comment on my last post. This is simply because we have been overwhelmed by the very kind thoughts, comments and offers of support that everyone has so generously extended to us all it seemed more appropriate to post our gratitude in this fashion rather than repeating it ad nauseam. To each and everyone of you then, thank you very much indeed from all of us - it means an awful lot. This is off topic for sure and I really don't know why I am writing this but I guess I just had to get this off my chest. I have just spent from 3 a.m. Saturday morning until 7:30 p.m. Saturday evening at first one and then a second hospital whilst my son has his jaw rebuilt (it is badly broken in numerous places) as the result of a completely unprovoked attack in a nightclub on Friday evening. He was completely blameless and enjoying a night out (his first for over a month as he has been working his socks off - he is a self employed electrician I should add) with some friends for somebodies stag night. It was a very 'sensible' night as many of the older generation were in attendance so none of the usual high jinks associated with such an occasion. My son and I have disagreed on many things over the years but I love him all the same and any parent will understand that of which I am speaking. It is difficult to be forgiving, or spiritual or anything else other than incandescent with blind fury at this and my son was lucky. Lucky it was not worse, a whole lot worse in fact, as in brain damage or anything else more severe. As you can imagine, he looked awful, like something from a bad horror film. To the three 'gentlemen' concerned I hope that they never have to experience what we have been through over the last 36 hours. Actually I retract that, I really hope that they do. And far, far worse into the bargain. I had a bit of a sort out of the various pieces of Jutland material I have in an attempt to add a little order to the chaos. The first thing that dawned on me was that the rules effectively are in two parts. There is the rather nifty strategic map movement system and the all important tactical set for the battles thus generated. I pondered this for all of a nano-second and have decide that the tactical rules tidy up should come first and then the strategic dimension can come later. The big advantage of doing this is that I will be able to fight battles much sooner than envisaged. I also have a whole raft of additional ship counters I can download and stick to the blocks including missing ships from the RN and High Seas Fleet, the Baltic Russians and also a selection of ships for (and this will be dear to the heart of Mr Fox) Coronel and the Falklands. Whilst this tidy up is ongoing I can give some thought to the models I want to use eventually and my thoughts at the present time are leaning towards 1/3000th - purely because you just about get everything you are ever likely to need and that will probably swing the decision. It is funny how your thoughts can be led in a particular direction by the simple expedient of being inspired. My recent dabbling back in the world of Avalon Hill's Jutland has given me much pause for thought in respect of exactly what I want from my naval wargames. Jutland is of course about big ships and fleet actions and the emphasis is very much geared towards placing the player in the position of an admiral. Of course with this approach compromises have to be made and so light ships - light cruisers and destroyers in the game - are handled in an abstract fashion, with a counter representing a division of cruisers or a flotilla (or half flotilla) of destroyers. At this stage many traditional naval gamers would be reaching for a copy of Jane's for succour at this blatant heresy - multiple model bases? Whatever next? Joking aside, using counters/bases to represent multiple ships may be a little stylised and of course will mean that individual classes will get submerged in the mass but surely for a fleet level action this is no bad thing from a convenience point of view? From the viewpoint of the commanding admiral then using cruiser divisions or destroyer flotillas would be an obvious command level and to be honest, an admiral driving battle squadrons around will not have time to worry overmuch about individual destroyers - more likely what the formations of these are up to! Similarly, the light cruiser screens are usually performing a vital function in respect of scouting and similar so can be safely left to their own devices for the most part as they battle their opposite numbers. Big battles usually mean big ships and so Jutland is firmly camped in the big ship sphere in respect of mechanics for firing and damage. There are a selection of critical hits available for both gunfire and torpedo damage which adds the all important 'feel' to the individual ships. The additional rules I have from the various magazines add an additional layer of 'chrome' (not complexity as such as the rules are very simple in execution in any event) and so the end result is a system that ticks pretty much all the boxes for me and my planned adventures in this period. What of Paul Hague's Sea Battles in Miniature I hear you ask? What indeed. I want to use these rules for games at a lower level with perhaps a dozen or so models a side. Again, they have the appropriate level of detail (although designed for large battles) for the actions I intend fighting and in the scale I would like to use. The end result of all these mental gymnastics is that I have made a decision about what I want to do and how I want to do it. Jutland is ingrained in my gaming DNA and such a weighty legacy cannot be lightly set aside. What I want to do then is to tidy up the Jutland rules and to incorporate the appropriate variant rules from the various magazines over the years so that they are a coherent whole. This will also mean preparing playsheets etc which should then ensure that if used in a club night setting everything will be in one place and easy to interpret. I will also need to rework the damage sheets - not because the versions with the game are bad - to reflect the squadron organisation at Jutland which will make things easier with multiple players commanding units. So there you have it, yet another project (well not really, just bringing an old one back up to speed) but with a realistic chance of completion - basically because all the ground work has been completed already and all I shall need to do is bring order into the chaos. More on Jutland - A Lot More! Great read and worth signing up for! Well it has been a busy couple of days on the Jutland research front. My attention was drawn to the Old Soldier magazine - Old Soldier that came about as a follow on to the Boardgamer magazine which in turn followed on from the old Avalon Hill General. Tom Cundiff, the owner of the Old Soldier magazine was able to put me in touch with Bruce Monnin - the owner of the Boardgamer. Bruce very kindly sent the PDF of the article that I wanted (although he pointed out this was not his usual method of operation) and it is absolutely bang on the money for what I want. Coming back to the Old Soldier, it appears that they also produce a number of very nice counter sets for many of the old Avalon Hill games - including a stonking set entitled Jutland: All the World's Navies which is a collection of all the major warships of the world converted into Jutland terms and with a very nice coloured counter to go with it, as well as all the data sheets required. This is a magnificent piece of work although sadly beyond my current budget (USD 125 for the whole thing although you have to cut the ships out yourself) although if I could get the data sheets it would be a massive boost as I would be using models in any event. I would like to express my thanks to both Tom and Bruce for helping out with this - it is hugely appreciated! You may recall that I recently acquired a copy of a disc containing scans of all the Avalon Hill Naval boardgames and I have used the same to print off the counter sheet for Jutland. Needless to say over the years the game has seen many variants and rule amendments which all serve to enhance the original. I am a great fan of this game and have had some cracking battles over the years - although not for a while though. I fully intend to rectify this soon and the Jutland blocks I have made will serve very nicely. I am currently redrafting the rules into a simpler format that incorporates many of the options contained in the various magazine articles published over the years but I have hit a minor problem. A significant rule update was published in the Boardgamer magazine (the follow on to the AH General magazine) - volume 5 issue 3 (July 2000) that I would really like to include in my redraft if possible. I am currently trying to track this down although a disc containing every issue published of the magazine is readily available. I am loath to buy this simply because it seems like a lot of money to pay out for a single article as most of the other games featured I either do not own nor am I interested in. I will report any progress as and when I have any news. A number of years ago I picked up a copy of the above and was greatly affected by the contents therein. For those of you that are unfamiliar with this book it is an account of young boy serving on the Russian Front from 1942 until the end of the war, firstly as member of the supply troops and then in the Gross Deutschland. The book covers the Russian winter, brutal battles against the Red Army and Partisans, leave, illness, and the perennial concerns of a front line soldier - food, sleep and shelter. It is by turns chilling, frightful, heroic, comic and always deeply thought provoking. It is one of my most read books and it always serves to remind me that however bad my own situation might be at least I live in a safe environment; well fed and warm and with the prospect of a violent death very far removed. There has been much debate over the authenticity of the detail in Sajer's book but in my opinion this would probably be expected. Given the sheer continual trauma that most of the book is given over to it is no surprise that some detail is a little awry - a point that the author touches on when he argues that one should read military history under conditions of extreme discomfort and usually sleep deprived in the cold and wet at dawn in order to fully appreciate what he endured. I cannot comment on the authenticity and detail as I am not an expert on the Russian campaign and so will leave that to the experts but the story reads in a realistic and believable way and is full (perhaps too much so) of period 'feel'. Within the account are numerous ideas for games and so I fully intend turning some of these into Portable Wargame or MOMBAT scenarios. In fact I plan to dedicate game number 21 to just that so we will be heading out to the Eastern Front for action involving the Red Army and the soldiers of the Gross Deutschland Division. A brief outline of the history of the division can be found here although several more detailed histories are available. If you go down to the woods today....No introductions necessary for this one but I suspect you would not want to be on the business end of it! Hot on the heels of my recent 'Hell's Highway' - Operation Market Garden based Portable Wargame I decided to strike whilst the creative iron was still hot and follow up with another game, this time set in the Ardennes during the Battle of the Bulge. In many ways this is similar to the previous scenario although in an expanded form - especially in respect of the hardware on show. I also wanted to try the Portable Wargame: Modern rules out on a 12 x 8 grid and to try something out in connection with artillery. I felt that indirect artillery was a little too flexible in the last game - changing targets seemed a little too quick for my taste - although the effect in action seemed absolutely right. What I have come up is to only allow indirect fire if at least one friendly unit has a line of sight to the target. I realise that blind or map fire was used but I wanted a measure of control over the use of it. So, in a nutshell: Indirect fire is only permissible when a friendly unit has a line of sight to the target - bear in mind that a 'target' can also be a terrain feature. As per usual, the artillery strikes are marked by a white 'Mastermind' pegs and destroyed units are tipped upright prior to being removed. I should also apologise in advance for the somewhat verdant nature of the battlefield - sadly the only winter terrain I possess is the Memoir '44 snow covered battle board! The 'Elite' troops are of course SS with the armour representing King Tigers. The 'Poor' leg infantry are Volksgrenadiers. The German initial positions. Note the armour massed in the centre with the flanking infantry and support. An armoured reconnaissance unit leads the way - hopefully to Antwerp! 32 strength points with an exhaustion level of 16 - again, hanging on for grim death. All the US troops are rated as average - primarily because of the variety of units forming the defending force. The American positions. The artillery is well to the rear and the wood to the right is strongly held by infantry supported by a mortar and a machine gun and is covering the main road. Note the SP AT unit behind the hill on the left. The US forces were aware that the Germans had launched a massive offensive spearheaded by elite panzer troops but the allied response, although sluggish, disjointed and haphazard, was managing to gradually draw the sting from the attack. Countermeasures were in hand and so any delay to the German attack could only serve to help the inevitable Allied counterattack. The German infantry would be easier to defeat as opposed to the armour as once the air umbrella was available again the tanks would be fair game for rocket firing ground attack planes. Isolate the tanks and defeat would surely follow but holding a (King) tiger by the tail is an occupation fraught with peril. The German offensive was initially successful but gradually stiffening resistance and critical fuel issues meant that attacks that ordinarily would not have been considered were forced upon the leading units in order to maintain the momentum. Tactical subtlety is now at a premium and so 'blitzing' strong points that would normally be bypassed and mopped up later at leisure is an unwelcome imperative if the offensive is ultimately to be a success. A short, hard thrust through the centre of the American position, relying on the awesome power of the King Tiger, should be more than sufficient to force the issue. It was a gamble, but by this stage of the war, more and more of the directives from Berlin had the hallmark of being all or nothing or even double or quits. Turn 1. No artillery fire so it was straight into the move. The German advance commences (led by the armoured recce unit in the van of the Panzers) whilst the Americans are content to await developments. A brisk exchange sees the Americans take heavy casualties whilst the German armoured cars are forced back. Turn 2 Artillery Fire. The US artillery (based at the rear of the town) straddles the German recce unit but to no effect. Meanwhile the German artillery (top right) is still moving up into position. Turn 2. The German recce unit moves aside to allow the first of the tanks to take centre stage. The rest of the attackers shake themselves out into formation for the assault whilst the US move their tank destroyers (on the hill to the north of the town) to engage the enemy whilst their leading infantry pull back deeper into the town. Turn 3. The German armour on the road engages the US antitank battery whilst the US tank destroyer scores a hit against the second enemy tank unit (on the hill). The US machine gun finishes off the armoured recce unit whilst the Germans bring up their Panzergrenadiers in the centre. The German machine gun (at the bottom of the picture) manages to score a hit against the Americans in the wood whilst the Volksgrenadiers move up in support. Turn 4 Artillery Fire. The American artillery force the Panzergrenadiers back whilst their tank destroyers suffer from the German artillery. Turn 4. The leading German armour unit roars through the town up to the American antitank battery whilst the Panzergrenadiers engage the infantry on the edge of the town. The second tank unit moves down from the hill in support. The American force in the wood (at the bottom of the picture) pulls back deeper into the wood. Turn 5 Artillery Fire. The US artillery, bought down almost on the heads of their own troops, inflicts further damage on the leading German tank unit. Turn 5. The remains of the German armour in the town is finished off by the antitank battery whilst the US Tank destroyer meets a similar fate at the hands of the second German armour unit. The Panzergrenadiers continue their assault and are gradually gaining the upper hand. Turn 6 Artillery Fire. Once again the US artillery comes to rescue and drives the Panzergrenadiers back but the German response causes heavy casualties on the northernmost US infantry unit. Turn 6. The Panzergrenadiers disengage from the infantry and roar into the town to brush aside the remnants of opposition whilst the tanks take their place, with the motorised infantry follow up. Dramatically though, the German Volksgrenadier unit (at the bottom right of the picture) comes under intense machine gun fire from the wood and suffers crippling casualties. Turn 7 Artillery Fire. The German artillery plasters the town but to little effect whilst the US guns force the Panzergrenadiers back once again. Turn 7. The gallant US antitank battery betters the Panzergrenadiers whilst the desperate Volksgrenadier attack against the north of the town comes to naught. The Germans have failed and the vaunted Panzertruppen, the instrument of victory for so many years, taste the reality of gradual, final and irredeemable defeat. The final score - US 11, Germans 15 so a fairly conclusive victory for the Americans. It was a tense affair to be sure and served to emphasise the paramount importance of combined arms when tackling a strongly held town or village. The German gamble in trying to 'blitz' the village with tanks could have worked had it been forced early on but operational friction and the disjointed nature of the pace of the advance all combined to derail the plan. The Americans fought when they needed to and pulled back into cover when necessary although still suffered casualties - testimony to the ferocity of the fight. All worked well although I am thinking along the lines of increasing the movement distances slightly, perhaps with the move 2 with no combat or move 1 and combat for infantry as an example. I have always liked the idea of having options with movement in that respect as it adds an extra level of decision making to the process of the game turn. This game is also the 20th held in the man cave since the start of the years so my plan to fight two a month is now back on schedule. I have decided though, to fight another six games between now and the end of the year which will give me 26 in total or one every fortnight. Lt.General Horrocks to Lt.Colonel J.O.E. Vandeleur (aka Michael Caine) of the Irish Guards - "I've selected you to lead us, not only because of your extraordinary fighting ability, but also because, in the unlikely event the Germans ever get you, they will assume from your attire that they've captured a wretched peasant and immediately send you on your way." I spent some time yesterday evening giving Bob Cordery's Portable Wargame: Modern a run out with a small scenario loosely based on some of the fighting that took place along 'Hell's Highway' - the road from the Belgian frontier ending at Arnhem - as the American Airborne forces desperately hung on to positions ensuring that 30 Corps could reach the beleaguered British. The Germans launched numerous 'hasty attacks' (in modern parlance) against the narrow corridor with pretty much whatever troops happened to be at hand - from elite Fallschirmjager through various Panzer troops down to 'old men on bicycles'. As ever, the blocks were used with the olive set representing the Americans (of the 82nd Airborne) and the grey the Germans. Basically I treated each block as a separate entity within the unit and so for combat purposes rolled a d6 per block. Retreat results affected the entire unit. I also allowed troops in cover to exchange the first retreat result of a combat to a loss of a block instead. I treated all troops as average as I felt this better represented the disorganised state of the assorted American paratroops after landing - units being mixed up, command casualties, dispersion etc - and the overall varied quality of the German opposition (see above for details). I also made use of an exhaustion level for each side - this was set at 50% (11 blocks) for the Americans (simply because they had to hold at all costs and the overall troop quality was high) and at 33% (8 blocks) for the Germans due to the bewildering quality and variety of troops in use! The opposing forces - note how the German armoured and motorised infantry is represented by a pair of standard infantry blocks combined with an armour and wheeled unit block. The initial positions - note the densely forested edge of the playing area. The German plan was very simple. An armoured assault on the right flank with a pinning attack in the centre utilising both tanks and motorised infantry, flanked with conventional infantry supported by field artillery. The US plan was to hang on and a unit of infantry was held in reserve to be used as and when needed (the top left hand square, next to the commander and the artillery). Turn 1 Artillery Fire. The German armour on the road was targeted by the American artillery and lost a base as a result whilst the paratroopers in the centre are similarly affected (note the white markers indicating artillery strikes and the upturned blocks for casualties). Turn 1. The paratroopers stay firmly put whilst the German advance in the centre along the road and on the right flank get underway. Turn 2 Artillery Fire. Disaster for the Germans on the road as the US artillery batters the attacking armour in the centre. Meanwhile the German artillery switches fire to the paratrooper position on the other side of the road causing some casualties. Turn 2. With the destruction of the German armour in the centre the supporting motorised infantry disembark prior to moving into the woods. Meanwhile both German flanking attacks continue to advance. Turn 3 Artillery Fire. Both sides artillery switch targets with the flanking German armour taking casualties but the US paratroopers in the centre suffer severely. Turn 3. The German flanking attack gets underway with telling effect from the combination of tanks and mechanised infantry. Meanwhile the sole surviving element of the central US paratroopers retires from the edge of the village whilst reinforcements are summoned from the rear. Turn 4 Artillery Fire. The American artillery switches fire to spoil the German armour attack on the right hand end of the village whilst their foremost positions come under more enemy artillery fire. Turn 4 and Turn 5 Artillery Fire. The US machine gun opens fire to telling effect on the advancing German infantry (destroying two blocks). When the artillery fire resumes a telling barrage lands on the German motorised infantry inflicting casualties and driving them back into the woods. The German reply inflicted casualties but by then the damage had been done. US 10 blocks, Germans 8 so the Germans lose by virtue of having reached their exhaustion level and are thus incapable of further offensive action. It was very close though! Despite being only 4 1/2 turns long this was an interesting action to fight. I made an initial mistake in rating the US artillery too highly (I classed it as being field artillery but for a 75mm pack howitzer perhaps this was a little generous!) and boy was it effective! The big guns were the main casualty inflicting source for both sides although the machine guns certainly did their part and the German armour/mechanised infantry combination was also rather useful. I have to say that the whole idea augurs well for the future and I reckon that in 20 mm it will be something to see (as indeed it already has!). It felt strange fighting on squares rather than hexes and to be honest, I did have to remember how to measure ranges in a different way or more than one occasion as I kept trying to use diagonals. I would also prefer to use a larger area so the next game will be fought on a 12 x 8 grid. I will also need to lock down unit compositions - especially for motorised and mechanised types and the whole embarking/disembarking thing. Adjusting the exhaustion level to take into consideration overall troop quality is a quick and easy device to employ rather than using multiple troop qualities for varying unit types although this will not always be the best solution. At this stage I really wanted to concentrate on the overall feel rather than low level detail. Great fun and a very pleasant way to spend an evening. I have spent the day trawling through recruitment agencies and attending an interview for another contract role - thus far a fruitless but necessary process. I feel drained and with a minor lingering headache (something I suffer from very rarely as a rule) so will be foregoing the club this evening. SWMBO is out for the night so I have the TV at my disposal and a stack of Blue Rays waiting to be watched but I am not sure if I can the enthusiasm together to do so. One bright spot in all this is that I have had a good opportunity to go over Bob Cordery's Portable Wargame: Modern rules which are available as a download from Here. These are definitely a tonic for a scrambled brain and I fully intend to fight my next action using them - and with the new 'modern' era blocks I have ready. An idea I intend testing with them is using standard unit sizes - 4 blocks for infantry, 3 for cavalry/vehicles and 2 for support weapons and artillery. The number of blocks in the unit will determine the number of d6 that are rolled for fire or close combat although any retreat result will affect the entire unit, not just an individual block. I will also introduce the exhaustion level once again - probably set at a base of 33% of the number of blocks a side is fielding, perhaps with a random adjustment based on overall quality or tactical situation. I am planning a WW2 game but as yet am undecided at to what form it will take. I am veering between the Russian Front or Holland 1944 as both will give me good attacker/defender match up. Ideally I should like to tackle something from the desert but sadly I do not as yet own any desert terrain although I hope to rectify this soon. The original book - I seem to recall loaning this from my local library dozens of times! The latest version - with additional material and guess what? It is now on my 'to get' list! In common with many gamers 'of a certain age' I cut my wargaming teeth on the works of Messrs. Grant, Young and Lawford, Wise and Featherstone. I could not put them into any order of preference and have probably used ideas from any or all of them over the years. Certainly Charge has featured in much of my recent thinking - especially the organisational side - but now, and for a variety of reasons, Charles Grant's Battle - Practical Wargaming is taking centre stage. Many years ago I used to game WW2 using these rules and had some really good fights using Airfix kits and figures. The rules are simple and very effective and have probably inspired many other sets over the years. Inevitably though, more complex rules came to the fore and so Battle was pushed further and further back into the recesses of various cupboards. Memoir '44 really reawakened my interest in WW2 land gaming as a viable project - coupled with an overwhelming desire to make some tank kits! - as the rules are simple, effective and have a great feel to them. My recent purchase of Bolt Action, published by Osprey is very much an extra dimension as it focuses on games at a lower level - platoon level really - but the rules appear to be both simple and subtle with some very slick mechanics - and so here is the basis of my cunning plan. Building up a platoon of infantry of around 40 to 50 infantry - individually based - with support weapons to taste and a smattering of vehicles will enable me to use Memoir '44, the Portable Wargame or even Memoir of Battle and then the Bolt Action level will round off the number of options available. Nowadays the variety of plastic 20mm figures available is enormous so the very tempting possibility of going all 'old school' in terms of material is appealing in a whimsical kind of way. Well I broke with tradition and made the journey to Crystal Palace for the annual SELWG show for the first time since 1995, just before my daughter was born (she is now nearly 17!). Many thanks chaps, much appreciated! After having discussed the finer points of the film Shoot 'em up starring Clive Owen we made our way into the venue. Many thanks to Bob Cordery for these - I know have 17 similar to this and reckon that should I head to Greece next year I should be able to complete the collection! I won't go into too many details about the show - suffice it to say it was big, busy and with more temptation than you shake a large wallet at! - and will instead let the pictures do the talking. I was able to catch up with a number of old friends including that rather splendid Bob Cordery - especially as he was able to pass over to me a selection of ceramic houses acquired for me from his recent Adriatic adventure. We talked about things many and varied and it was good to share several thoughts around our respective gaming ideas. As ever, always a pleasure Bob - we should get another game in at some point as well! Aspern-Essling 1809 - I forgot the club in question (apologies chaps!) other than the fact that my old Newham gaming friend Derek Oram was commanding some French! I read this many years ago and was really pleased to pick this up for a mere £8! Just to prove that I can suffer from the 'Ooh, shiny' syndrome just as much as the next man although DO NOT expect me to tackle this in 28mm! I also picked up a selection of CinC 1/4800th WW2 ships from Wargames Emporium - mentioning Tim Gow opened up all manner of doors - and they are absolutely drop dead gorgeous. the range is limited to the RN and KM for WW2 but what the heck - I can live with that minor inconvenience. Many thanks once again to the Rejects and Bob Cordery and to all the clubs that chatted about their particular games. I have mentioned on a couple of occasions of my fondness for the old Avalon Hill game of Jutland - the table top game covering the Jutland operation in 1916. In my opinion it is one of the best naval games ever devised and I have played it many times in the past. It is designed with large actions in mind and has both a simple but effective strategic and tactical level set of rules. Some time ago I purchased a disc containing scanned copies of all the Avalon Hill naval titles and the articles about the respective games published in the defunct Avalon Hill General - the company in-house magazine. Jutland of course featured and so in a moment of inspiration I printed off the counters sheets onto sticky labels, cut the lot out and have stuck them to 3/4 sized blocks! This mean that the game can live again as I already own the rules, ship charts, plot maps, measuring devices etc. The blocks are more durable than card counters and so I would have no problem using them at the club so I am thinking that perhaps a club night mini campaign may be on the cards. In the meantime though, I shall give the entire concept some additional thought as for my own purposes I have a number of ideas to pursue using this approach. The blocks in their final form. From left to right - top row: command, infantry, cavalry an artillery, middle row: machine gun, mortar and anti tank gun and bottom row: armour and wheeled vehicles. Last night I labelled the 180 blocks I needed to complete the six colour selection of generic armies I have constructed. That is it. They are done. Finished. Ended. The only additions I can foresee with the collection would be scenario specific specials or possibly - and I am giving this some serious thought - some unit order/status/designation type labels. A good example of this might be a paratrooper symbol on a block to add to an infantry unit - rather like special units in Command and Colours Ancients. I am also toying with producing named commander blocks and also named terrain features as well - purely for ease of identification and to add a little specific 'feel'. That is all for further consideration though in due course. That is 138 blocks per colour (red, blue, green, grey, brown and olive) or 828 in total. I still have around 400 blocks of this size remaining although half of these will need stripping before I can use them. Actually only the artillery need the labels removed so the core units above could readily be expanded for the occasional epic action if needed. The designs are pretty much NATO standard except for the command block which uses the symbol from David Chandler's Campaigns of Napoleon. The machine gun and mortar should really have an additional chevron but when I tried this it looked a little busy so I went for the single arrowhead. The anti tank gun symbol merely needs a line (rather like a capital A) to become an anti aircraft gun although I suspect I will use a designation block for this should the need arise. Now that the tools are ready and in place the next order of business will be to make use of them! A blast from the past and a challenge to the ironing skills of the average wargamer! Whilst organising the block storage for the finished collection I had occasion to have a rummage through my filing system where I rediscovered the packet you see above - from circa the late 1980s. I seem to remember buying several packs of this and also very successfully hex gridded a 6 x 4ft green cloth and a sand coloured version as well. The original cloths have long gone but I have more than sufficient to cover a couple of new 6 x 4ft cloths should the need arise. The hexes are 3" across the flat sides and the blue cloth used as the backdrop in the photo may well be the first recipient of some transfers when the ironing board is next out. During my recent games using the blocks and Heroscape tiles rather than Hexon I decided that even the smallest buildings from my current collection had too large a footprint on a hex. Even using a single block to represent a unit meant that hexes would be very congested when including terrain - the same also applies to trees, more of which in a later post. I decided that I would need to use smaller buildings and so looked around for suitable alternatives. My initial thought was to use 1/300th buildings but even they seemed a little on the large size (although could be easily used for the larger Hexon set up). My next thought was to look at 2mm but the problem there was that much of the currently available range from Irregular Miniatures seemed to be too 'featured' for my purposes. Much of their range features buildings that are almost mini dioramas and include roads, fields and other terrain features. They are quite spectacular when painted but are too much for what I need. Then it came to me. The houses and hotels from this famous boardgame are just the right size for what I want and although I was not about to remove the same from the family copy of the game I was able to source a supplier that sells them separately on eBay. The version I have acquired was ridiculously cheap - £4.80 for 25 each of the hotels and houses - and best of all is made from hard plastic (like that used for plastic kits) rather than the usual polythene or wood. I fully intend painting these and will also add a little detailing as well. I will probably base them on a hexagonal piece of plastic or similar and make sure that sufficient room remains to be able to place a block when occupied by the same. My plan for Middle Eastern buildings is to make use of the two stud Lego style MegaBloks as they are a basic rectangle which would suit the main building style across the region. Next up will be the trees and for those I will be using 1/300th scale models as they will fit admirably within the smaller hex and without too large a footprint. Space and Warships - a match made in Heaven?